It may be time for a new No. 1 in AAAA and if it is, Lithonia looks ready to take the mantle. The Bulldogs won 20-straight games during the middle of the season and finished the year at 27-3. Lithonia saw an early lead slip away in the quarterfinals as the Bulldogs fell to Cairo 61-47. Contributors Kesean Warren and Christopher Roberson have graduated but more than enough returns to make Lithonia a serious contender for a state title. Senior guards Rodney Chatman and Tyheem Freeman make up a tough backcourt while senior forward Tyleen Patterson chips in on the offensive and defensive sides of the ball. Transfer Jacara Cross, a 6-foot-6 senior forward from Cedar Grove, instantly rounds out a now balanced attack. Cross averaged 15.9 points, 6.5 rebounds and 2.7 blocks as a junior and is known for playing above the rim. Coach Wallace Corker has a chance to have a special team and finally knock off Jonesboro from its perch. With MJ Walker and Head Coach Daniel Maehlman still in the mix, it’s hard to pick against defending repeat state champion No. 2 Jonesboro. The Cardinals defeated Carrollton 55-50 for the state championship and finished 32-1. Walker is still only a junior and is thought of as a five-star forward. He is coming off a season in which he averaged 17.3 points, 4.0 rebounds and 2.6 assists per game. Tracy Hector (Kennesaw State) and Austin Donaldson (Georgia State) were key cogs in the two-time state championship reign, but are now set to make an impact in college. Even with the loss of a couple starters, Coach Maelhman will not accept anything less than the best from his team. Jonesboro’s calling card has been its tough-nosed defense that has been unparalleled in the state and that will not change. Defense will once again be the factor that separates the Cardinals from the rest of the pack. Sophomore power forward Jamari Smith and senior guard Tariq Jenkins will be asked to take on more of the burden and support Walker as the Cards try to three-peat. The dynamic junior duo of Davion Mitchell (Auburn) and Richard LeCounte is too much for No. 3 Liberty County to be ignored. 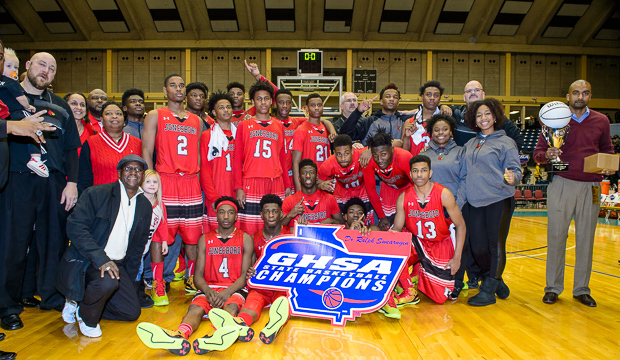 The Panthers enjoyed a 24-5 season but ran into the Jonesboro buzzsaw in the semifinals. Mitchell and LeCounte were harassed into 21 combined points on 8-of-25 shooting, but the Cardinals were on a whole other atmosphere defensively. When not playing the best defense in the state, Mitchell averaged 18.8 points, 4.7 rebounds, 7.3 assists and 3.3 steals. LeCounte was equally impressive, going for 18.5 points, 9.6 rebounds, 3.4 assists, 2.3 steals and 1.1 blocks. Jishaun Harris plays bigger than his 6-foot-3 frame and averaged 6.6 points and 7.0 rebounds. The one thing holding back first-year Head Coach Julian Stokes’ Panthers could be their lack of size. They might not have had the sexiest record at 18-9, but No. 4 Bainbridge is not a team to overlook. Explosive senior guard Tyree Crump is a Georgia-commit and flat out knows how to score. The 6-foot-2 dynamo averaged 22.6 points, 4.7 rebounds and 3.3 steals in 2014. Crump highlights the Bearcats’ five top scorers who all return for 2015-16. Senior power forward Trevon Shaw has proven to be an X-factor. Bainbridge played eventual AA state champion Seminole County three times and handed the Indians all three of their losses (28-3). In those three games, Shaw was the difference maker. He went for 25 points and 21 rebounds in an 80-64 win, 24 and 10 in a 65-64 victory and 19 and 10 in their final meeting, 78-74. With a new coach brings new expectations and the sky may be the limit for Coach Anthony McKissic and No. 5 Sandy Creek. After coaching the Morrow’s girls team, McKissic takes over the reins of a team ready to make a statement. The Patriots went 17-11 last year and fell to St. Pius in the first round, 63-46. Senior guard Christian Turner is heading to Gardner-Webb while 6-foot-5 junior Elias Harden is a hot prospect ranked four-stars. Freshman guard T.J. Bickerstaff is long and has had an impressive summer. Learning behind and playing beside Harden and Turner can only help Bickerstaff’s growth moving forward. Inside, the Patriots have some athletes as well. Senior Keith Heard II is 6-foot-8 and can erase mistakes at the rim. Sandy Creek is in-line to be one of the most exciting teams in the state if everything clicks. If slow and steady wins the race, then No. 6 St. Pius is in good shape. The Golden Lions might not be as exciting and high-flying as other teams, but Coach Aaron Parr’s team is as good as they come and will limit mistakes and let teams beat themselves. They can shoot it from deep and go inside and fight for tough buckets. The Lions displayed their versatility to play any style as they dumped Sandy Creek in the opening round of state and played defending champion Jonesboro as good as anyone could in round two, losing 67-57. Senior forward Kerney Lane is a load to handle inside and can stretch the defense as well. Lane is a crafty lefty that can score with both hands and stands 6-foot-6. Christian Merrill and Jakob Spitzer also provide matchup problems from their forward positions. Junior guard Carson Seramur made some nice contributions last year and freshmen twins Brian and Matthew Gonzalo can make all the plays that older guards still struggle with at times. A 25-5 mark in 2014-15 could possibly be eclipsed in 2015-16. The depth in Region 1 was quietly one of the deepest in the entire state. A lot of seniors have graduated from the top four teams in 2014, leaving way for No. 7 Worth County to make a major leap behind one of the best frontcourt duos in the state. The Rams finished 16-9 overall and 8-6 in region play under Coach Arthur Davis. Davis is now out and in is former state championship winning coach in 2003 while at Mitchell Baker High School, Roney Mays. He will enter a nice situation with 6-foot-8 power forward and Auburn-commit Anfernee McLemore returning for his senior season. The big fella averaged 19 points, 11.8 rebounds and 6.4 blocks per game. Brandon Moore isn’t as tall (6-foot-5), but the senior was actually the team’s leading scorer as a junior. Moore went for 19.5 points, 9.9 rebounds and 2.2 blocks per game. A 76-71 loss to Cairo in the region tournament kept the one-two punch out of the state tournament. No. 8 Henry County could catch some teams by surprise if they haven’t been paying attention. The Warhawks were 16-13 last season, but showed the ability to challenge anyone as they lost to Liberty County in round one of the state playoffs in overtime 74-72. Head Coach Vincent Rosser has some horses to ride this season. Junior guards Damion Rosser and Javon Greene are strong and can get to the basket at will, or pull up and knock down the mid-range jumper. Both have had exceptional summers and are geared up to make a name for themselves in AAAA. Another junior, Kovi Tate, is a strong presence inside but also has the ability to see some minutes at the three. Tate is a transfer from Woodland-Stockbridge where he averaged 7.1 points and 4.6 rebounds. No. 9 Grady was 14-15 and lost to Woodward Academy 58-48 in the first round of the state playoffs. The Knights’ top four scorers all return for their senior season. Coach Brian Weeden turns to Bucknell-bound guard Avi Toomer to create offense. The guard poured in 19.8 points per game and also led the team in rebounding at 7.6 per contest. Joining Toomer on the perimeter is Ahmad Herron, a guard that paced the Knights in three-pointers made (43) and percentage (48%). Herron pitched in 11.4 points while Joshua Jones chipped in 10.3 on average. Sophomore point guard DJ Brittian transfers over after playing at Miller Grove and will bring a winning pedigree with him. No. 10 Columbia is the fourth team from Region 6 to crack the top ten. The Eagles were downed in round one by eventual state runner-up Carrollton, 54-43. Coach Kerry Sandifer’s team finished 18-11 last season and will look to improve, but will be without center Micaiah Henry who is now at Tennessee Tech. Rodriquez Dennis does return however as the team’s leading assist man at 3.4 per game. Junior forward Reyhan Cobb stands 6-foot-7 and blocked nearly two shots per game. Justin Longstreet is back after banging home 43% of his three, while junior Jalen Cobb and senior team captain Nathaniel Ambersley solidify the backcourt. Likely to nobody’s surprise, Miller Grove comes in ranked No. 1 for the 2015-16 season. The Wolverines were denied a shot at a seventh straight state championship when they were unceremoniously dispatched by Warner Robins in the quarterfinals in overtime, 63-57. It was a rematch of the 2013-14 championship game in which the Wolverines routed the Demons 70-43. Even though last season was a disappointment in terms of Coach Sherman White’s lofty standards, Miller Grove still managed a 27-4 record. This year’s edition of Miller Grove might not have a true go-to post presence, but they will have one of the deepest backcourts in the state. UConn-commit and First Team All-State selection Alterique Gilbert runs the show after averaging 17.7 points, 6.0 assists and 5.4 steals his junior campaign. Joining him will be transfers Aaron Augustin (Peachtree Ridge), Tae Hardy (Southwest DeKalb) and Colin Young (Laney), three highly talented guards. Augustin averaged 16.6 points, 4.3 rebounds and 4.3 assists as a junior and has committed to play college ball at East Tennessee State. Hardy jumps across the county after pouring in 16.5 points a night as a sophomore. Young, a 6-foot-3 guard, was named Region 3-AAA Second Team after pitching in 11 points per game. The senior is a knockdown shooter who led the Laney Wildcats with 49 threes, connecting at a 46% clip. He will get plenty of opportunities to spot up with Gilbert and Augustin running the show up top. Senior forwards Raylon Richardson and Aidan Saunders bring length and versatility to the table. A potential game-changer may be junior Joshua Jackmon, a big-bodied guard who turned heads with his physical defense this summer. Balance. That is what you get with No. 2 McIntosh. The Chiefs are ready to challenge for a state championship after finishing 29-1 with their only loss coming to M.L. King 66-65 in the Sweet Sixteen after point guard Will Washington broke his wrist after having a layup blocked and coming down hard on it. With Washington healthy and every key piece returning, Coach Jason Eisele’s bunch is in great shape, loaded with experienced seniors. Washington is one of the best passers in the state and runs the high-powered Chief offense to perfection. He averaged 12.7 points, 9.3 assists and 1.9 steals in 2014. The go-to guy on offense is Furman-commit Jordan Lyons, a lethal shooter and more importantly scorer. Lyons shot an absurd 66% from inside the arc (127-of-193), 87% from the line (203-of-234) and 45% from distance (95-of-211) en route to averaging 24.7 points. The Chiefs have the size inside as well to pair with the potent outside duo. Seniors Chase Walter and Dishon Lowery are dynamic inside. At 6-foot-6, 215 pounds, Walter carves space down low and finishes at the rim (69%). He averaged 10.6 points, 8.9 rebounds and 1.8 blocks a season ago. Lowery, another 6-foot-6 forward, has a non-stop motor and a great afro. He averaged 10.5 points, 11.5 rebounds and 3.3 blocks to anchor a stingy interior defense. Sliding into the three-spot will be senior forward Isaac Kellum, who comes over from Fayette County where he chipped in 13.8 points per game. His 6-foot-4 length should thrive in McIntosh’s efficient offense and tough defense. No. 3 Gainesville had a disappointing end to the 2014 season. The Red Elephants entered the Region 8-AAAAA tournament at 23-2 but lost to Cedar Shoals in the semifinals and then were blown out by Apalachee 78-44, giving Gainesville the No. 4 seed in the state playoffs after winning the regular season region title at 12-1. 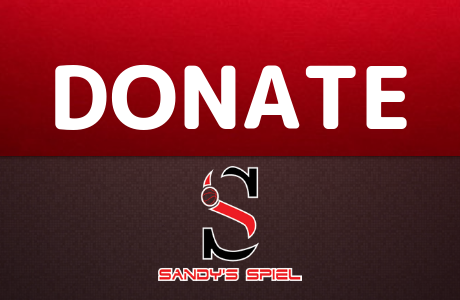 In round one of the playoffs Gainesville slipped by North Atlanta by two but lost to Jones County 65-64 in round two. This experienced squad should improve upon last year’s 25-5 record and contend deep into the playoffs. Senior forward D’Marcus Simonds decommitted from Mississippi State and will head to Georgia State following his senior season. Coach Benjie Wood has a nice blend of youth and veterans for this year. KJ Buffen is an extremely talented sophomore forward, who had a great offseason whereas Messiah Dorsey is a reliable senior guard. Sophomore guard Xavier Bledson had some big games as a freshman and will help round out a talented lineup. Gainesville will need to replace 6-foot-10 center Tyler Scott in the middle. No. 4 Allatoona enjoyed a 29-3 season and an appearance in the state championship game, but struggled to get anything going against the bigger Brunswick Pirates. The Buccaneers lose top offensive threats Bradley Brevet and All-State Second Teamer Rodney Brown, but return an extremely talented and savvy backcourt in senior guards Kevin Perry and Ephraim Tshimanga along with sophomore Trey Doomes. Tshimanga’s recruitment has heated up over the summer as defensive playmaker who makes all the right decisions on offense. Perry is another good decision maker who can hit an open shot while Doomes has the upside to be special in Coach Markus Hood’s system. Senior Dylon Ramsey is another player to keep an eye on. The 6-foot-1 guard can do a little bit of everything on the floor. The Bucs have been as dominant as they come in the regular season, compiling a 95-10 record and a perfect 57-0 mark in region play since 2011-12. 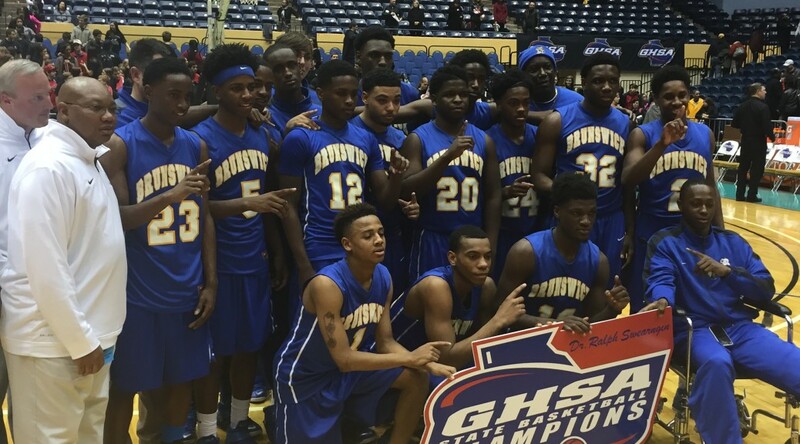 Brunswick finally got the respect it deserved as the Pirates captured the state title last season over Allatoona, 49-32. This year they will open at No. 5 after losing three big components to their 29-2 title team. Double-double machine and AJC Class 5A Player of the Year Roger Davis, Jabril Heck and Darius Lampkin have all graduated, but centerpiece junior Kymani Dunham returns. The unmovable 6-foot-7, 240-pound center dominated in the state championship, scoring 14 points and grabbing 9 rebounds while shooting 7-of-8 from the field. Dunham’s recruitment will begin to heat up this year as he takes the next step into becoming one of the state’s best big men. Coach Chris Turner will need to find consistency to add around Dunham. Depth is an issue as only five players scored in the state championship. Of those five players, only Dunham and senior guard Zach Moore are back for 2015. Mike Pauley has stepped down as head coach, but former LaGrange assistant Mark Veal slides over a chair and inherits the No. 6 ranked team in the state. The Grangers burst onto the scene back in 2010 when LaGrange went 31-0 before falling to Columbia 54-46 in the state championship. Last season’s team finished 22-8 and fell 47-45 to Allatoona in the quarterfinals. Coach Veal will have one of the best backcourts in the classification to rely on in seniors Rico Smith, Qua Epps and Mike Hardy to go along with the dangerous Laperion Perry, who is only a junior. Smith garnered AJC All-State Second Team honors and has sights set on going out with a bang his senior year. If the Grangers can find steady production inside to pair with their outstanding guard play, Coach Veal might be in-line for a very successful first season. Ding-dong the witch is dead. No. 7 Warner Robins slayed the mighty dragon that is Miller Grove in a stunning quarterfinal overtime victory. The Demons finished 25-5 before faltering against Allatoona in the semifinals, 63-39. Some important pieces have graduated, but postseason hero and two-sport star Marquez Callaway is back for one last run. Callaway, an AJC All-State Second Team selection, sank 17-of-17 freethrows en route to 24 points to knock off the Wolverines. Donovan Brown, a 6-foot-8 forward, also returns for his final season and is a key cog in Coach Jamaal Garman’s defensive and offensive scheme. Garman still needs to replace Nate Curtis, Stephon Raybon and 6-foot-7 center Donald Watkins if the Demons want to have another magical postseason run. If for some reason you were sleeping on No. 8 Heritage-Conyers last season, you won’t this season. Coach Vernon Denmark’s team finished 20-10 and advanced to the second round of the state playoffs before losing at LaGrange 65-52. A 56-53 win over Tucker (29-3) to usher in the New Year should have alerted the rest of the state of the Patriots’ presence. A trio of playmaking juniors lift Heritage into the top 10. Isaiah Banks is a 6-foot-4 guard that averaged 12.3 points and 5.6 rebounds last year. Banks is prime to explode this season and see his recruitment take off. Running mate Jordan Thomas pitched in 10.6 points while Byron Abrams filled the stat sheet week-in and week-out with 7.1 points, 3.4 assists and 3.5 rebounds a night. Senior Makyle Wilkerson can be a game changer with his size at 6-foot-6. He averaged 9.8 points and 7.7 rebounds and still has room to grow defensively. Coach Dennis Woolfolk has a very good bunch returning for No. 9 Jones County. The Greyhounds’ top six scorers all return, with five of them now seniors. Jones County ended the season 21-10 and showed their guts and guile in the postseason, picking up wins over Harris County 75-73 in overtime and Gainesville 65-64, before falling to eventual state champ Brunswick in the quarterfinals, 59-49. Senior guard Devin Wooten can fill it up from deep and led the Hounds in scoring with 14.8 points a night while chipping in 3.3 assists, 4.8 rebounds and 1.8 steals. Junior Nick Singleton was the team’s second leading scorer at 10.3 points and also dished out 4.2 assists and collected 2.3 steals. Landrevius Bowden, Jayvaugn Patterson, Jerry Stephens and Anthony Parker give Coach Woolfolk a plethora of options to turn to. One achilles heel however might be the Hounds’ lack of true size. After just a 14-win season in 2013, the No. 10 Cedar Shoals Jaguars made a deep run into the state tournament before bowing out in the semifinals to Brunswick, 44-43. D’andre Mahaffey came up with big shot after big shot, but has since graduated. In his place it will be Phlandrous Fleming to take the final shot. Only a junior, Fleming has seen his recruitment pick up after a strong season playing shooting guard. At 6-foot-3, his athleticism and length gives him the ability to guard any position one through three. Florida A&M is the first team to offer Coach L’Dreco Thomas’ top cat. Cedar Shoals will be in the hunt to make state again depending on the growth of senior guard Jerrick Mitchell and junior forward Stavion Stevenson, who both played big roles in the Jags’ Cinderella run. Shiloh gets the nod as my No. 1 team heading into the 2015-16 season. Four transfers join recent Georgia Tech-commit Josh Okogie to form a favorite in the state of Georgia. The three-star forward averaged 21 points and 7 rebounds and now has electrifying guard Darnell Rogers (George Washington), steady ball handler Khalil Richard (Siena), shooter Greg James and big man Thurman Massenburg all joining the party over in Snellville. Don’t forget about senior guard Malik Chandler, who adds depth and is coming off a season in which he was the team’s third leading scorer at 9 points per game. The Generals were 28-4 last season and suffered their only in-state loss to Pebblebrook in the state semifinals, 57-47. Sliding in at No. 2 is Norcross, who comes off a quarterfinals appearance (80-62 loss to Pebblebrook) and a 27-4 season. The Blue Devils continue to reload and unlike most of the teams in the top 10, the annual powerhouse did not turn to the transfer scene to land its top players. Junior forwards four-star Rayshaun Hammonds and three-star Lance Thomas bring versatility and a matchup nightmare for the rest of the deep Region 7. Sophomore guard Dalvin White is mature beyond his years and senior guard Chris Curlett has been through the rigors of playing in the state’s highest classification and is battle-tested. But it is a newcomer who might be able to return the Blue Devils back to the peak of the mountain top. Freshman guard Kyle Sturdivant can handle the rock, get to the basket and pull up on a dime and can the mid-ranger jumper. Coach Jesse McMillan will have another extremely dangerous team that can beat opponents in a multitude of ways. If you are looking for a team that will have the biggest turnaround this season, look no further then Westlake. 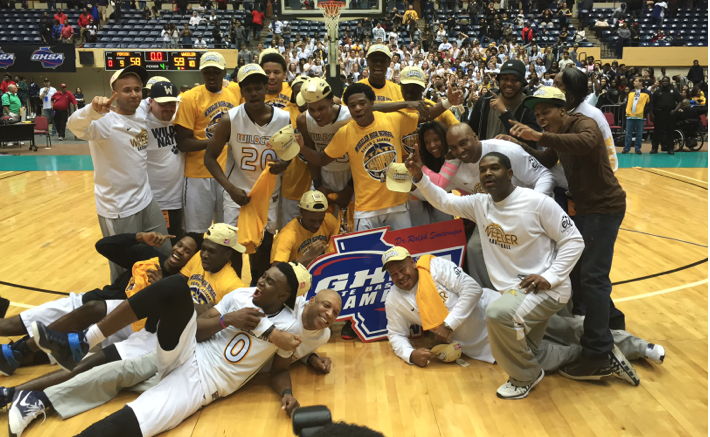 The Lions were 13-15 last season and lost to McEachern in the opening round of the state tournament. Region 3 has transformed into a gauntlet and the best region in the state in terms of top four teams. The Lions are No. 3 with the additions to an already talented roster. The offense will revolve around Langston Hughes transfer Chuma Okeke, a four-star junior forward who averaged 22.8 points and 8.3 rebounds as a sophomore. Ronald Bell, a tough-nosed three/four man also is joining Westlake after starring at North Atlanta. These two pieces will join a slew of talent: senior guard Raquan Wilkins, junior guard Daniel Lewis, sophomore guard Jamie Lewis and junior 6-foot-9 power forward Michael Durr, who is tabbed as a four-star talent. It’s never easy to not rank Wheeler No. 1, but the Wildcats will have to prove they can win without Jaylen Brown. They should have no trouble however, with four-star point guard Darius Perry running the show his junior season. Perry took a backseat to Brown (Cal) and Shembari Phillips (Tennessee) last season, but now will be asked to be a focal point of the offense. He will have help thanks to a trio of long and athletic transfers. Senior 6-foot-8, four-star forward Romello White, has landed back in Georgia. White already has committed to Georgia Tech and improved by leaps and bounds while at IMG Academy in Florida last year. Reikan Donaldson is a rangy athlete who joins the Wildcats after playing his freshman season at Calvary Day in Savannah. Lastly, Al-Wajid Aminu, younger brother of NBA player Al-Farouq Aminu, transfers in from Florida as a 6-foot-6 wing that has just committed to North Florida. Returning is Cameron Jordan, another big guard who will be asked to take a bigger role this season. The defending champs finished 30-3 in 2014-15 and have a chance to be even better defensively this upcoming year. No. 5 Milton has really redone its roster and was one of the most active teams in terms of player movement this offseason. Coming off a 17-12 season with a first round exit at the hands of Alpharetta, Coach Matt Kramer will attempt to compete with Wheeler for the Region 5 title. The Eagles will be anchored inside again by 6-foot-8 four-star Harvard-commit Chris Lewis. The big man will have plenty of talent surrounding him for his senior season. Junior guard Kendrick Summerour has transferred in from Kell and is a slick, And-1 type ball handler with the ability to get to the rack. Sophomore Justin Brown averaged double digits from his guard position at Northview last season and 6-foot-8 power forward Kyrin Galloway comes over from Buford to pair with Lewis inside and provide the Eagles with some elite length in the paint. Alex O’Connell, a junior, could be a potential X-factor for Milton. He averaged 7.7 points last year, but has continued to grow in the offseason and his stock has begun to explode. ACC schools are already in the hunt for the knock down shooter. No. 6 Pebblebrook was last year’s state runner-up after a controversial foul call gave Wheeler a 59-58 victory. The Falcons were 27-6 and had one of the most talented rosters in the state. Gone are center Derek Ogbeide (UGA) and guard Ty Hudson (Clemson), but Jared Harper (Auburn) is still here and so are huge additions JJ Smith from North Carolina and Collin Sexton from Hillgrove. The three make up possibly the strongest 1-2-3 backcourt punch in the state. Harper averaged over 20 points per game last year, while Sexton was Hillgrove’s leading scorer and top playmaker. The game changer here is JJ Smith, a four-star junior guard that stands 6-foot-4. Smith has freakish athleticism and can do everything on the court. Last season as a sophomore he averaged 19.4 points, 5.9 rebounds and 3.8 assists per game. If Coach George Washington can find some role players to help out this big three, the Falcons could easily soar back into the state championship. No. 7 Collins Hill tailed off after a hot start last season. The Eagles began 15-2 after a 13-game winning streak, but faltered the rest of the way going 3-6, finishing 18-8 and missing out on the state tournament. Senior guard/forward Kai Lambert returns after scoring 12.2 points per game and grabbing 8.8 rebounds. He will have some talented new faces around him in sophomore power forward Chris Parks (Lanier), senior forward and transfer from Duluth, AJ Cheeseman (New Orleans-commit) and Towers High School transfer, small forward TeShaun Hightower. These three give Coach Ty Baumgardner some much needed strength and length. Cheeseman averaged 11.4 points and 7.1 rebounds at crosstown rival Duluth, while Parks chipped in 8 points and 5.2 rebounds and Hightower poured in 12 points a night at their respective schools. Collins Hill also has some quietly steady guard play that comes from juniors JD Ozoh and Max Clark. A young team that might be beginning its climb back to the pinnacle of the basketball scene is No. 8 Berkmar. The Patriots finished 13-15 in 2015 and played well against Norcross in round one of the state tournament before bowing out, 62-49.Three juniors make up a talented backcourt that could sneak up on teams if they haven’t done their due diligence. Al Durham returns after averaging 14.2 points and 5.6 rebounds. Zach Cooks slides over to man the point guard position after seeing plenty of time at Norcross and Jay Estime is a knockdown shooter that joins the Patriots after averaging 10.7 points at Peachtree Ridge. Durham and Estime both have designs on becoming division one players. Another transfer, Robert Hill, a Duluth transfer, is a big body at 6-foot-8 but he must become eligible first to make an impact. Berkmar’s strength will lie in its guard play and depth. Leroy Jones IV and Lane Foster both will see big minutes in the backcourt and will be asked to guard top perimeter players. No. 9 Newton might have been a sleeper to some teams last year, but not anymore. The No. 4 seed finished 22-9 and knocked off defending champion Tift County in round one of the state playoffs 52-49, before stunning Dacula 58-54 in round two and falling to Wheeler in the quarterfinals 72-54. Coach Rick Rasmussen is one of the best in the business and picked up career win No. 200 late last season. Guard play is the name of the game with this bunch. Junior guard JD Notae can score in a variety of ways while the same can be said about senior Jaquan Simms. The one player to keep an eye on is freshman guard Ashton Hagans, who has been nothing short of impressive. He will be counted on to contribute right away and give the Rams one of the scariest three-headed backcourt monsters you might not have heard of. Newton had a great offseason and ran its summer record up to 25-1 at one point. Depth, length and heady guard play is the story for No. 10 Lambert. The Longhorns were banged up at the end of last season and were dumped by Hillgrove in the Sweet Sixteen, 73-59, but still managed a school-record 24-6 season. Senior guard Tanner Hall returns after being named Forsyth County News’ Boys Basketball Player of the Year. He averaged 15 points, 4 assists and 4 rebounds and has garnered attention from low-major division one programs. Hall can stroke it, get to the basket and find the open man. Senior 6-foot-7 forwards Ross Morkem and Connor Mannion are usually the beneficiaries of Hall’s passing and much like Hall, both have a chance to play at a high level in college. Junior Andrew Melms came on strong last year from his guard position and gives Coach Scott Bracco a very nice duo running the offense.